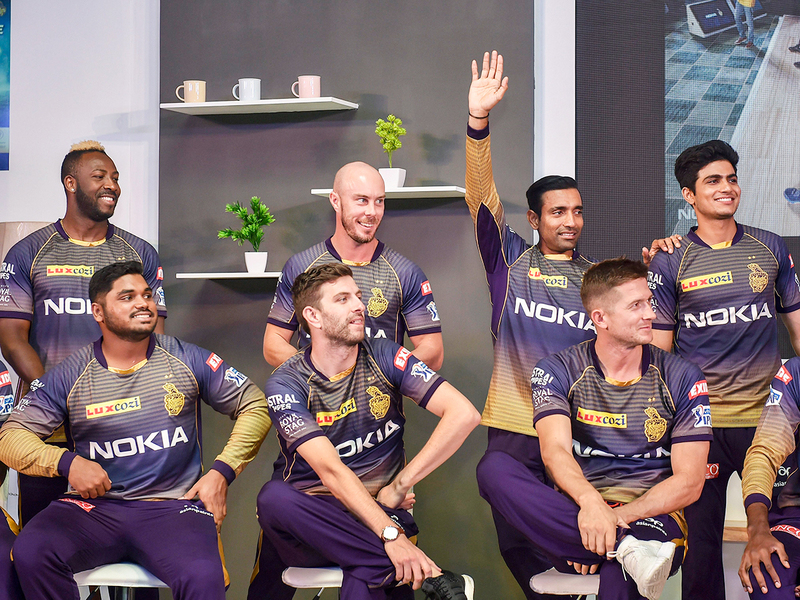 Kolkata: Eyeing a third title which has eluded them for quite some time, Kolkata Knight Riders (KKR) will have their task cut out when they take on formidable Sunrisers Hyderabad (SRH) in their Indian Premier League (IPL) clash at the Eden Gardens on Sunday. Two-time champions KKR last won the IPL in 2014 under the captaincy of Gautam Gambhir. Since then, they have made it to the playoffs thrice in four years showing great consistency, but the team will want to finish off equally well this time round. Last season, under the new leadership of seasoned campaigner Dinesh Karthik, KKR incidentally lost to Sunrisers Hyderabad by 14 runs in Qualifier-2. Stumper-batsman Karthik led from the front, amassing 498 runs and finishing as the team's highest scorer. KKR have traditionally boasted of having a superb spin line up and it won't be different this year. With India's leading tweaker Kuldeep Yadav leading the line, veteran Sunil Narine and experienced Piyush Chawla will look to make an impact along with young K.C. Cariappa who was brought in as replacement to the injured Shivam Mavi. Last year, KKR's weak link was their pace attack. But according to head coach Jacques Kallis, the purple brigade have more options this time in the fast bowling department. KKR will miss the services of Mavi and fellow U-19 World Cup winner Kamlesh Nagarkoti who is also ruled out due to injury. But acquisitions such as New Zealand fast bowler Lockie Ferguson, left-arm Englishman Harry Gurney and West Indies all-rounder Carlos Brathwaite will add to their arsenal. KKR received a blow few days back in the form of South Africa quick Anrich Nortje who was also ruled out after sustaining an injury. Among the Indians, Prasidh Krishna will look to continue the good work with the ball while Sandeep Warrier -- replacement of Nagarkoti -- will look to make the most of the opportunity. KKR's batting looks strong with no spare tyres in their top seven. The likes of Chris Lynn, Shubman Gill, Robin Uthappa, Andre Russell, Karthik and Brathwaite pack enough punch to rival any other side. According to assistant coach Simon Katich, they have the best batting line up in the tournament. Coming to the visitors, SRH emerged runners-up in the previous edition after losing to Chennai Super Kings in the final by eight wickets. The Kane Williamson-led side has been in cracking form for the past few seasons since winning the trophy in 2016 under the leadership of David Warner. Williamson was comfortably the best batsman in the tournament hitting eight fifties and one century on the way to 735 runs in 17 matches. All eyes will be on Warner this Sunday, as the southpaw continues his return to cricket after being banned for a year after the ball tampering incident. Besides the explosive Warner and dependable Williamson, SRH have the likes of Martin Guptill, Manish Pandey and Yusuf Pathan who are likely to be their batting mainstays but the team will miss Shikhar Dhawan who went to Delhi Capitals. Dhawan hit 497 runs and was the team's second highest run-scorer last year. All-rounders Shakib Al Hasan, Mohammad Nabi and Vijay Shankar add variety to the team. The bowling will be led by Rashid Khan who was the second highest wicket-taker in the tournament last year. Billy Stanlake will provide the X-factor with Bhuvneshwar Kumar, Khaleel Ahmed, Siddharth Kaul and Basil Thampi also there to strengthen the pace battery. Kolkata Knight Riders (KKR): Dinesh Karthik (captain), Sunil Narine, Andre Russell, Carlos Brathwaite, Joe Denly, Lockie Ferguson, Chris Lynn, Robin Uthappa, Harry Gurnley, Kuldeep Yadav, Piyush Chawla, Nitish Rana, Sandeep Warrier, KC Cariappa, Shubman Gill, Rinku Singh, Shrikant Mundhe, Nikhil Naik, Anrich Nortje, Prithvi Raj and Prasidh Krishna. Sunrisers Hyderabad (SRH): Kane Williamson (captain), David Warner, Abhishek Sharma, Jonny Bairstow, Khaleel Ahmed, Ricky Bhui, Basil Thampi, Shreevats Goswami, Martin Guptill, Deepak Hooda, Siddharth Kaul, Bhuvneshwar Kumar, Mohammad Nabi, Shahbaz Nadeem, T Natarajan, Manish Pandey, Yusuf Pathan, Rashid Khan, Wriddhiman Saha, Sandeep Sharma, Vijay Shankar, Shakib Al Hasan and Billy Stanlake.